First Plastic Bags, Now Ticket Stubs, and Other Thought’s from Dre…. 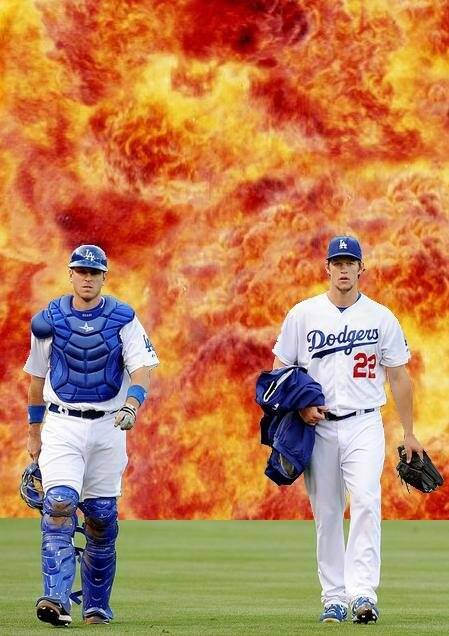 Pitchers and catchers report in 2 days…. Yes folks, that is an actual rain puddle behind Blue . 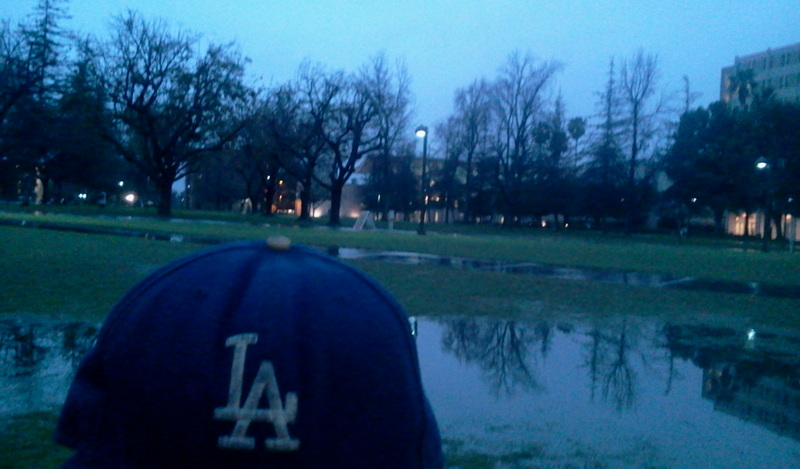 Yup, L.A. finally got some rain today. Enjoy this rain, said no one ever…. Because according to this 10 day forcast , this will be the last we’ll see of it for a while, assuming the 10% chance for tomorrow is accurate. I really can’t remember a time here in Los Angeles, or throughout the state of California, where we did not have any kind of heavy rain during such a stretch between December and now, this 6th day of February. So our drought continues …..
No Plastic, Now No Paper ? As many of you fellow Angelinos know by now, as of January 1st of this year, Los Angeles became the largest city in the nation to ban the use of plastic bags in grocery stores and other retail outlets, most charging 10 cents per paper bag or offering the choice to buy a re-usable bag. Now comes the news that Dodger season ticket holders will be going paperless, as the team has announced a paperless ticket program for 2014 , much to the dismay of fellow Dodger fan blogger Emma over at Dodger Blue World and i’m sure many other Dodger season ticket holders. That’s not to say the team is going entirely paperless, as they will continue to sell hard tickets at the box office. What’s was that I just said, hard tickets ? How many of you still collect your hard tickets ? 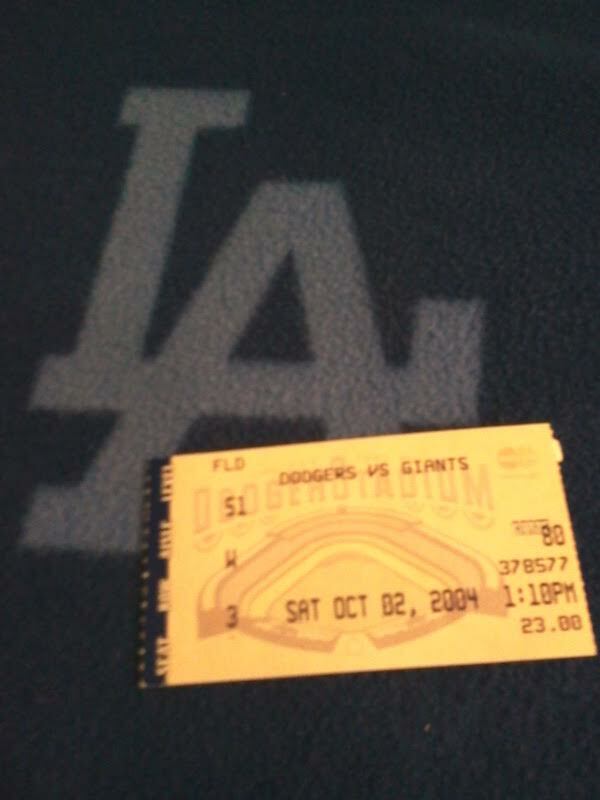 How many of you carry such fond memories of your hard tickets like Jon Weisman over at Dodger Insider ? Above, on the left, is a ticket stub, yes, that is an actual stub, from one of the automated will-call kiosks. I wouldn’t blame you if you confused it for an ATM receipt. This was from August 1, 2008, Manny Ramirez’s first game as a Dodger. To the right, the standard print at home ticket from Game 5 of last years NLCS . Nothing against the print at home option, and yes, it is a huge convenience especially when buying online from other season ticket holders from StubHub. I just say, give the season ticket holders their hard tickets as well, for memories sake !!! Above, from Opening Week , 2008 . On the left, the Coliseum exhibition game against the Red Sox, and Opening Day against the Giants, the 50th anniversary of Dodgers baseball in L.A.
A couple of from the road. To the left, Opening Week at the Giants new yard, Pac Bell Park, in 2000. And what a way to help open our bitter rivals new yard, with a 3 game sweep !!! To the right, a season ticket from old Busch Stadium’s final season in 2005 with Albert Pujols on the stub . What happened that afternoon ? Has it been 10 years already Finley ? Baseball can’t come back soon enough…. Oh yeah, for those of you who have a FB account, please follow Dodgers-LowDown for more of your Dodgers news and other good stuff. Those of us in Prime Ticket are definitely put out about going paperless since we always received a big box with absolutely beautiful tickets. I couldn’t agree with you more. The loss of actual tickets is really depressing. On a side note, I recently lost part of my collection including my much loved ticket from Kershaw’s debut. Would you have any interest in selling your’s? Feel free to email me if you are.